Classic Italian design stiletto featuring spring assisted opening. Spring Assisted - Press the index or use the thumb stud, and it flies open and "snaps" in place via the sturdy liner locking mechanism. 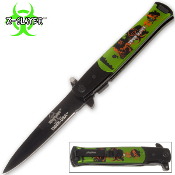 The razor sharp stiletto style blade features the words "Zombie Slayer" and is crafted from 1045 Surgical Tool Steel. This is a beautiful and solid built knife that won't disappoint you.